Celebrate the birth of the royal baby, Prince George Alexander Louis of Cambridge with our commemorative Royal Baby Souvenir issue, featuring 246 amazing photos of royal moments including his very first public appearance – remember his mini regal wave? We guide you through what’s in store for our future King from a lavish nursery and christening preparations to potential play dates with Europe’s fellow royal babies. 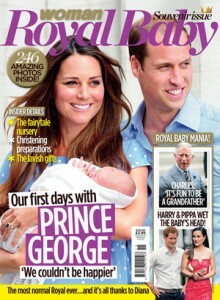 Plus, we take a look back at Kate and Will’s relationship, their baby pictures and the complete royal family tree. Royal Baby Souvenir special on sale now via all good retailers and supermarkets. Plus, you can download your copy today on iPad via Woman’s Own magazine in the app store. Click here to find out more.